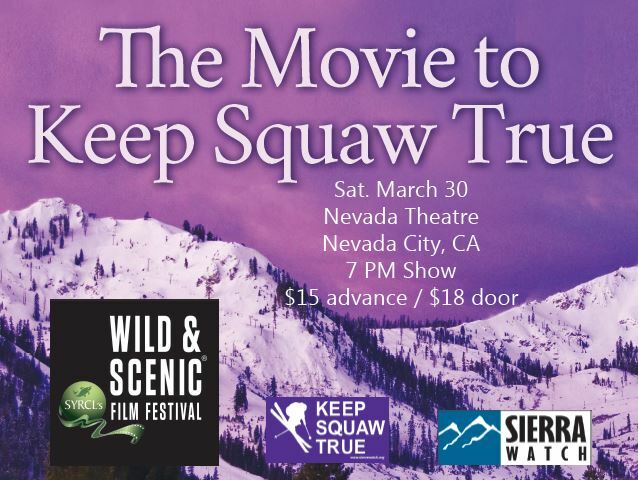 Sierra Watch is excited to partner up with Nevada City’s Wild & Scenic Film Festival for a homebase screening of The Movie to Keep Squaw True at the Nevada Theatre on March 30! Join us and South Yuba River Citizen’s League (SYRCL) as we tell the incedible story of a community rising up to defend our Sierra values along with two other great movies: the Wild & Scenic Official Selection, Big World, and a special one-night only screening of Keep Squaw True Locals Shreddit Edit, featuring Squaw Valley athletes and filmmakers. Time: 7:00PM. Doors and bar open at 6:30PM. All proceeds benefit Sierra Watch’s campaign to Keep Squaw True and SYRCL’s Wild & Scenic Film Festival.